This is the message being spread by local peace committees in Liberia as they work to maintain peace before and during the national elections. Local citizens, some of whom were previously in conflict with one another, are currently collaborating across sectors in four counties in Liberia to “say no to violence” during the West African nation’s elections, an effort supported by the Purdue Peace Project, a university-based political violence prevention initiative. These elections, which took place Oct. 10, 2017 with run-offs pending, are important as they will allow Liberians to demonstrate their commitment to the democratic electoral process, as well as lasting peace. Liberia has undergone two presidential elections since the end of its civil strife in 2003. Both elections, won by current president, Ellen Johnson Sirleaf, were marked by incidents of political violence. Liberia’s 2017 election is incredibly significant; it will be the first change of political power since Sirleaf’s election and will be the first election after the draw down of the United Nations Mission in Liberia (UNMIL) which placed Liberia’s security back in its own hands. With the election ongoing, local peace committees supported by the PPP in Bong, Margibi, Montserrado, and Nimba are continuing efforts to ensure a violence-free 2017 election. To read more about this work, click here (as of September 2017). Make a pledge to “Say No to Violence” and express your commitment on social media and in your community in written, video or visual form. Use the hashtag #ViolenceFreeLiberia to mark your commitment. Take the pledge: Download this image for your profile photo or to share on social media. 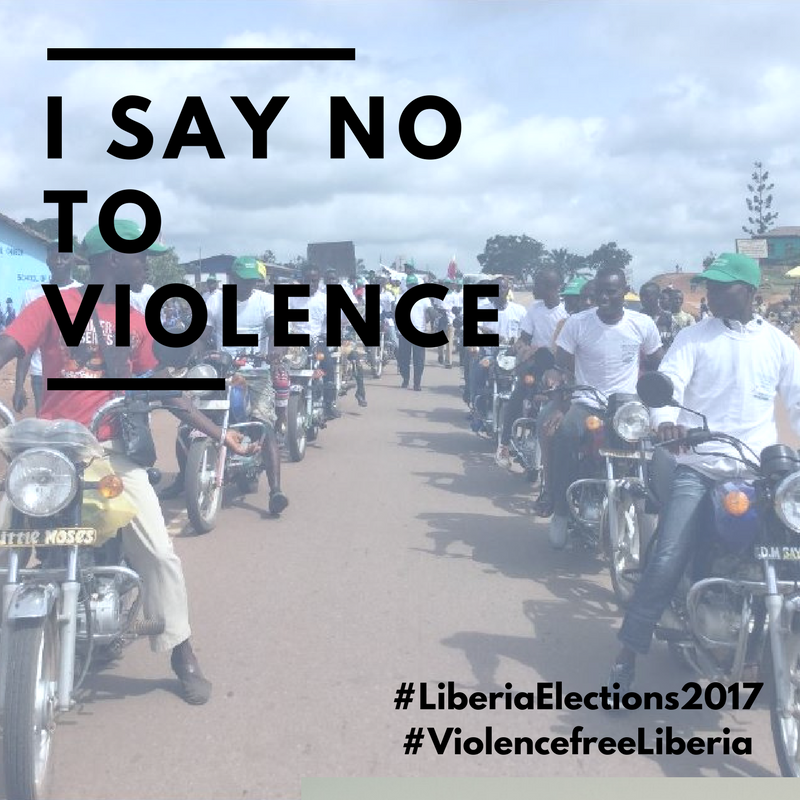 Share about the work being done to prevent violence in Liberia to raise awareness about the need for peaceful elections and to stand alongside those working for peace in Liberia. Spread the word: Click here for example messages to share on social media to help spread the word about violence prevention work in Liberia. Support the work of local peacebuilders and the Purdue Peace Project by clicking here and making a financial contribution. Donations even as small as $10 support and embolden local initiatives, including those pursuing a peaceful election in Liberia. For additional information about PPP-supported peaceful elections work in Liberia, please contact Dr. Stacey Connaughton, PPP Project Director, at sconnaug@purdue.edu. Watch an animation about the Purdue Peace Project's collaborations in Liberia. Watch videos of local peacebuilders promoting peaceful elections in Liberia. Read an article about the potential for violence around Liberian elections by the Purdue Peace Project for the Diplomatic Courier. Read a blog post about a recent trip Purdue Peace Project researchers took to visit project sites in Liberia. Read impact reports from the four counties where the Purdue Peace Project supports local peacebuilding efforts. Follow the Purdue Peace Project on Facebook, Twitter, and Instagram for regular project updates leading up to and following the Oct. 10, 2017 elections.